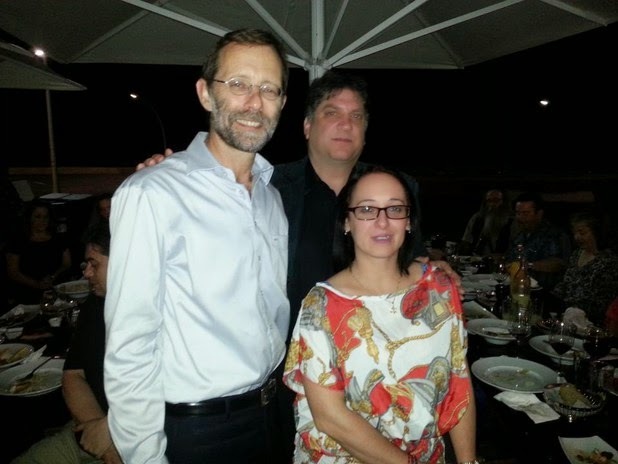 Photo from the JDL UK website shows Roberta Moore meeting with deputy speaker of the Knesset Moshe Feiglin in Israel. 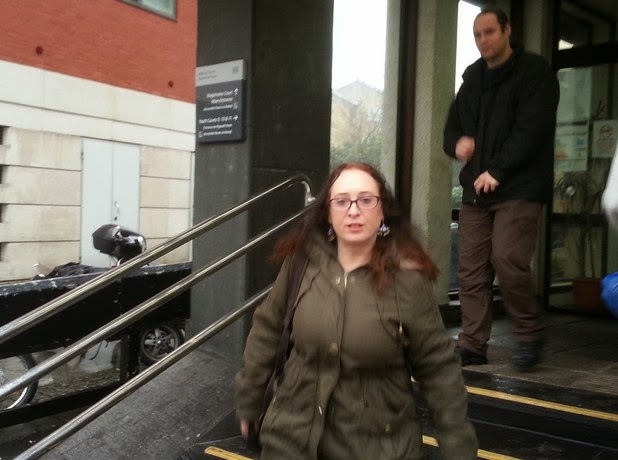 Two Jewish Defence League UK thugs were today found guilty of assault after they attacked a panel at a Palestine literary festival in September. Roberta Moore was convicted of two counts of assault and one count of possession of an offensive weapon. Her accomplice Robert De Jonge was convicted of assault. Both initially pleaded not guilty to all charges, but De Jonge on Thursday changed his plea to guilty for reason of recklessness. De Jonge argued he had only meant to cause a “distraction” when he rushed the stage and assaulted Andy Simons, the chairperson of the panel and an organizer with Haringey Justice for Palestinians. But district judge Julia Newton ruled today that De Jonge had acted with full intent to cause injury. The other man assaulted by Moore was Simon Assaf, who had been invited to the festival to run a stall for Bookmarks, the socialist bookshop. Moore sprayed the two men in the face with “Farb gel” spray paint, which the judge ruled was used in a way consistent with an offensive weapon. The two were released on bail until sentencing on condition they did not attend any event involving Haringey Justice for Palestinians. Sentencing will take place 23 March. The hearing this week took place over two days. Victim Andy Simons reacted with relief today. The attack briefly hospitalized him and meant he had to miss the rest of the festival on 20 September 2014. Simons, 62, a retired British Library professor, told The Electronic Intifada that the attack had taken an emotional toll, leaving him afraid to do further pro-Palestinian charity work. But he said he felt he had little choice but to testify in court this week, despite feeling intimidated by the two thugs. Moore and De Jonge visibly smirked through much of Simons’ testimony, recounting the assaults. Although Roberta Moore has a previous conviction for fraud, neither of the two have any prior convictions for assault – a relevant factor the judge said she would will take into account when deciding between a fine or a custodial sentence. The Electronic Intifada understands that Moore and De Jonge have engaged in such attacks before, but that in the past witnesses have been too intimidated to testify. Founded by the ultra-racist rabbi Meir Kahane in New York in 1968, the Jewish Defense League has been termed by the FBI a violent terrorist organization. Kahane was later elected to the Israeli parliament, founding the Kach party, which was banned as a terror group even in Israel. Irv Rubin, JDL leader from the late 1980s until his arrest in December 2001, died in prison in 2002 while awaiting trial for planning a series of bombings against a mosque and the office of Representative Darrell Issa, who is of Lebanese descent. In 1985, with Rubin as JDL leader, Alex Odeh, a Palestinian-American civil rights leader with the American-Arab Anti-Discrimination Committee was murdered by explosion after a bomb was planted in his office. The prime suspects in the case belonged to the JDL, but fled to the Israeli colony of Kiryat Arba near the Palestinian city of Hebron (a hot-spot for Kahanist violence). 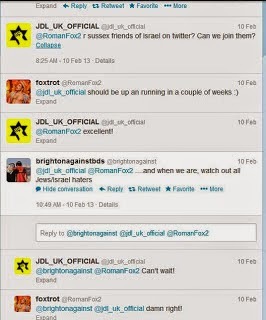 The Jewish Defence League UK initially appears to have no direct lineage from the US organization. 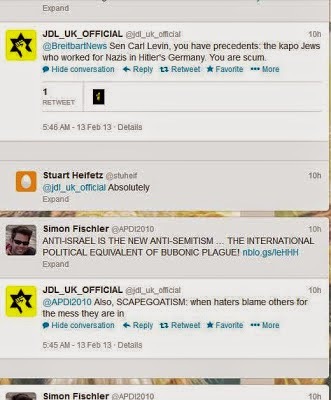 However, the group’s website clearly aligns it ideologically with the JDL, Kahane himself and especially with convicted JDL bomber Vincent Vancier. Vancier (aka Chaim ben Pesach) spent five and a half years in federal prison for no less than eighteen bombings in New York and Washington in the late 1980s. 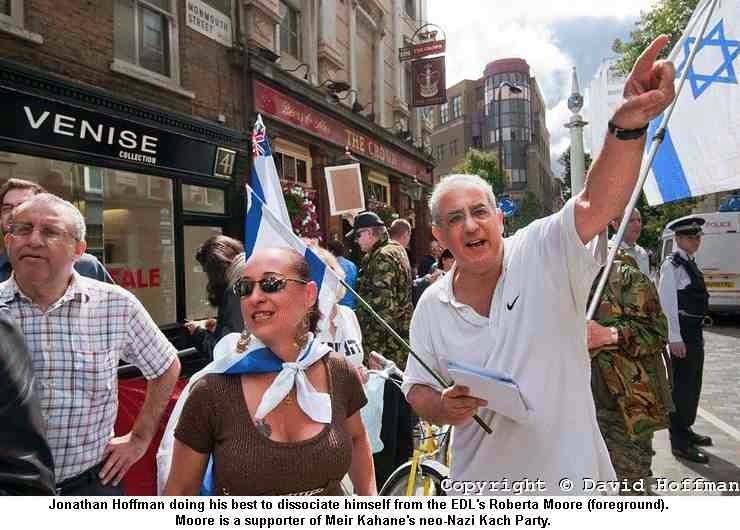 Roberta Moore was formerly a member of the racist anti-Muslim street gang the English Defence League, which has always been extremely pro-Israel. The Brazilian-born fascist infamously founded the EDL’s supposed “Jewish division” before she left in 2011 claiming to have suddenly discovered the presence of anti-Semites in the far-right group. 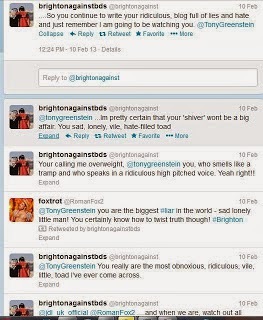 Other accounts say she was kicked out for being too extreme for even the EDL. 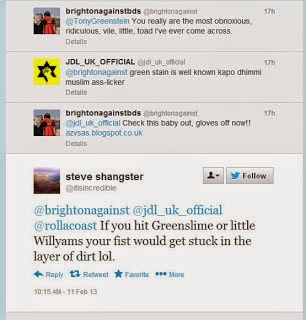 JDL warning Cobbs to be careful! From then on, she started identifying her group as “JDL UK.” In 2012, Moore expressed support for Norwegian killer Anders Behring Breivik, the extremist who in July 2011 massacred dozens of people in the name of protecting Europe’s Christian identity from an imagined Muslim takeover. Moore and De Jonge live together at a flat in Golders Green, north London. They are a fairly regular presence at Palestine solidarity protests where they harass, intimidate and attack peaceful campaigners. Moore and De Jonge appear to have a lot of enemies even within the right-wing Zionist movement. The extent to which they really are a “league” is questionable. However, the agenda of extreme violence and racism is clear. Will they one day be facing terrorism charges in the UK? Who has been responsible for their radicalization? 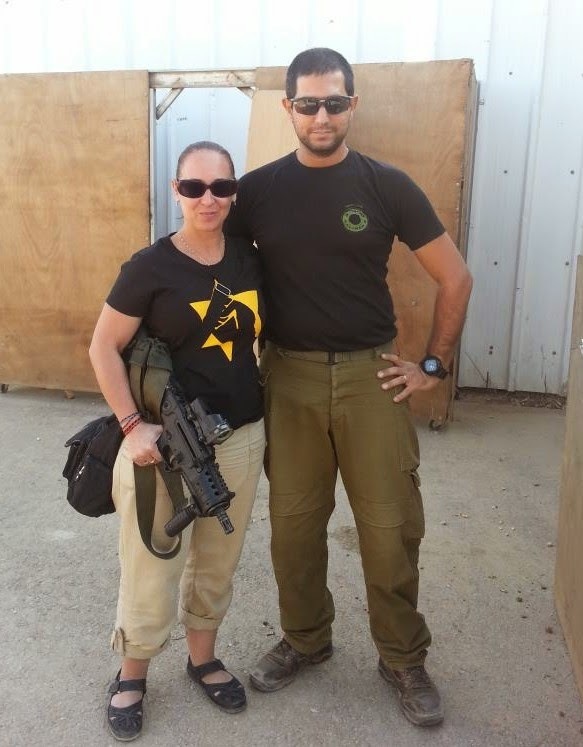 An armed Roberta Moore visiting extremist Israeli settlers in Hebron, in the occupied West Bank. Perhaps most concerning is the photo at the top of this article: Moore meeting Moshe Feiglin during her trip to Israel (along with Meir Weinstein of the JDL Canada). Feiglin is the deputy speaker of the Knesset, Israel’s parliament. During Israel’s summer 2014 war on Gaza he published a genocidal plan for the total destruction of the Palestinian people in Gaza.